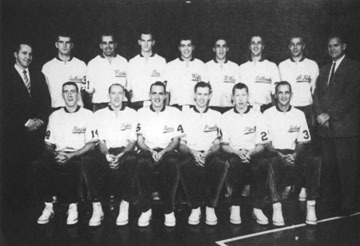 THIS CATERPILLAR TEAM, which finished fifth in the six-team National Industrial Basketball League with a 15-15 record over the 1957-58 season, surprised the basketball world by roaring through the Amateur Athletic Union postseason tournament in Denver for their fourth national championship in seven years. The Cats, coached by Warren Womble, needed four overtimes to turn back the Denver Truckers 74-71 in the championship game following victories over the Phillips 66 Oilers 90-53 in the semifinals, 70-59 over the McDonald Scots of Louisiana and 94-58 over the Navy All-Stars. B.H. Born, Howie Crittenden and Jim Palmer of Peoria were named A.A.U. all-Americans. 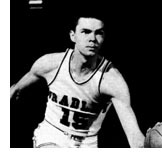 The balanced team had six players whose scoring average was in the 9.1-13.7 point range - Dean Kelley, Jack Sullivan and John Prudhoe in addition to Born, Crittenden and Palmer - and held the opposition to .374 field goal shooting for the season while out-rebounding opponents 53.1 to 45.5. Six members of this team were later named to the United States AAU All-Star squad that toured Russia.